Slow Design is a phrase arguably coined by Alistair Fuad-Luke (ii) in 2002 and is related to the Slow Food Movement: its overarching concepts are expressed well in six words by the organisation SlowLab (iii) : reveal, expand, reflect, engage, participate and evolve. When thinking about Slow Design philosophies one is never too far away from thinking about place and local identities and whilst not literally slowing down or doing things slowly, having a slower experience, being aware, going through the process and noticing the unknown may be part of the ‘slower’ experience. It is a truism that we often overlook some of the most obvious things in our environments, either dismissing them or not noticing the daily changes that happen around us. These days it may be easier to communicate with someone in another part of the world and not even know our neighbours’ names. At the same time we might note a wider acknowledgement of the impact of collaborative thinking and how ideas and projects might evolve through networks of people. So what is the value of spending sustained time in a place, watching it anew, looking for things that we have not seen, heard or thought of before? How people work, how they live, how they move about, what they leave behind in this process and how we observe this in consideration of our own daily routines may offer us new insight and processes in thinking and making/formulating designs new ways. I run an environmentally-grounded practice, developing projects using design methodologies that are rooted in an acute awareness of physical location, place and working practices. Since 2007 I have run the project ‘Making a Slow Revolution’ which focuses on identifying ideas about making in relation to place, provenance, co-design, relational methodologies, collaboration, gestational and layered time of processes, waste streams and walking, upcycling, mutability of life cycle and dialogue and conversation. I was invited to Berlin in order to develop a project related to this thinking with a group of students. The overarching aim of the walks was to make observations about the relationships between people and their environments. This was done by observing short-term day–to-day impacts and longer term temporally evolved traces of co- existence on the ground. The students set about mapping and recording through recording sound, making photography and drawing, finding and collecting objects, stories and histories. We aimed to show that small change and local activity could be revealed, experienced and observed through walking and re-walking routes through Berlin.The findings and thinking developed on these walks were then taken as a basis to catalyse methods for design thinking. The students were also asked to build a repository of information of the locations mapped individually and as a group. It was hoped that by the end of the project by engaging with, what all of us shared at this time, the city of Berlin, the students, through their direct experiences, would ultimately develop highly personalised new approaches to creative thinking. To be able to conceptualise and develop new materials, new thinking patterns, new networks, systems, models, processes and/or objects that related to and informed their practices as designers. With an overarching aim to think in new and unknown ways. Beginning. Where would we go? 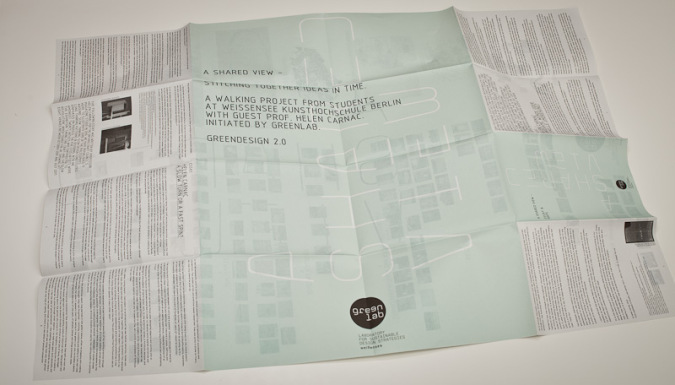 The project began when the group were asked to meet with maps, at der Haus der Kulturen der Welt. At that meeting the first route to walk was chosen. As we sat and talked and tried to think about a route it seemed to become obvious to all that we were sitting in the perfect place to start a river walk, through the heart of the city. So our journey began and took, us somewhat nervously and apprehensively, into the sunshine to head east and slightly south along the River Spree. The aim of the original two day walk was to walk and talk, look and be curious and to get to know each other. The students Eriko, David, Carmen, Adrian, Tine, Elise and Julia had brought ideas for walks and maps with them. Tine had some great old GDR maps that her father had loaned her, Elise had a fold out map that covered the city and beyond and we had an array of other maps and some not particularly good tourist maps, but nonetheless helpful in the sense that we could get a view of what a visitor might use to navigate the city. Photography seemed to become the order of the day, watching every move from behind a lens, as we proceeded along the river. It was to be the beginning of many journeys over the next four months. Although some of our first encounters were of grey-ness, of the flat parliament buildings whose only seeming adornment was the sunshine, this soon changed and we gradually saw buildings whose walls had become vibrant canvasses of graffiti, the contrast of private and public spaces and intriguing ‘void’ areas amongst other things. Indeed the spaces and places that were to become part of the student’s projects. This was an opportunity to look at the heart of the city up-close. Importantly the first walks were a time where the group got to know each other and where individual and shared interests began to be defined. On our first walk we even found a slow food cafe and shared a large feast of pasta, cooked freshly and generously by the proprietor. Everyone may have had sore legs at the end of the first two days but as we crossed the river by boat from Treptower Park to Karlshorst, it was with the beginnings of a newly defined ‘shared view’. Over the next four months the walks became the shared thread through the project. An important time to stop and consider the outside world and to watch the world and the comings and goings of people and the changing nature of a place. We took at least eight documented walks during the duration of the project, some planned and some spontaneous. The planned walks were decided on by the students, perhaps to a place they had visited before and wanted to show the rest of the group or to somewhere more unknown. The students spent some time thinking about mapping during several walks and responding directly to place in others. The group also took some spontaneous walks, in order to get out and about, to talk and look and to refresh their minds. There are short descriptions of eight walks in the first chapter of part two of this book. Interestingly for a group of students focussed in making and materiality it was the fabric of the city, seen through its ruins and empty spaces that seemed to be most intriguing to them. I believe it is the nature of substance and materiality that they were drawn to. In general, throughout the project, we were able to push doors and walk into places that would normally be out of bounds in other cities. Why were we walking and what would the outcome be? Walking was intended to slow the group down in order to look at things at street level, first hand and to question what was seen. It was also seen as a shared and sociable activity, a place to discuss what the group was doing, what was noticed and why and to have conversations with people that we came across – to hear other peoples’ stories. Such a project is drawn out with the intention of discovering through doing. If the group were willing to openly seek questions from the environment, were inquisitive and proactive, then in the longer term they would be able to generate ideas for themselves. Interestingly, but not surprisingly I have been asked on numerous occasions, from the beginnings of the project, what would the outcome be? What was the tangible object that would be produced? Would it be a chair, a bag, some sort of product? The answer was often ‘I don’t know’. This answer was not one of ignorance but a genuine not knowing, the type of not knowing that occurs when you are seeking to design through a process of research and understanding, looking, problem solving and thinking about necessity or need. What was there to design or understand from the situation the students placed themselves in? Would the students design a product or a system? What would they feel was necessary from what they encountered? Ultimately the aim of the project was to develop and embed design thinking and for the students to find and use primary sites of research to develop thinking from. Using Slow Design philosophies was part of the brief, however I tend to think that the same term would now be better defined as ‘long thinking’ processes and this is my preferred terminology. 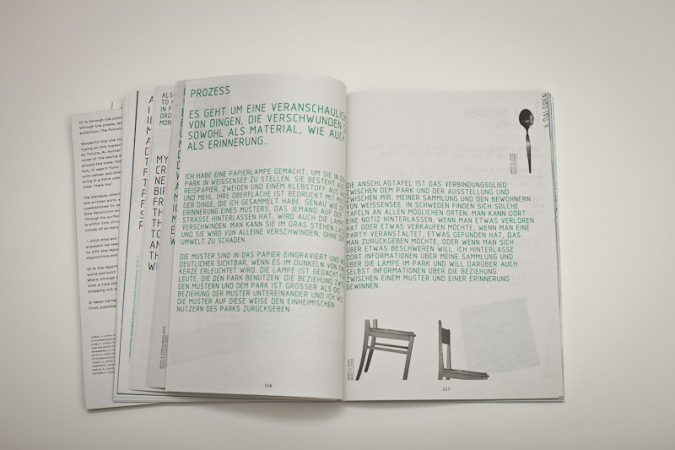 The students all participated in the group walking project, of which you can see a number of maps, photographs and descriptions within this publication and which they showed at a group exhibition at Kunsthochschule Weissensee in July 2011. The group worked well together and shared their thoughts and responses openly, holding group critiques together while I was back in London. 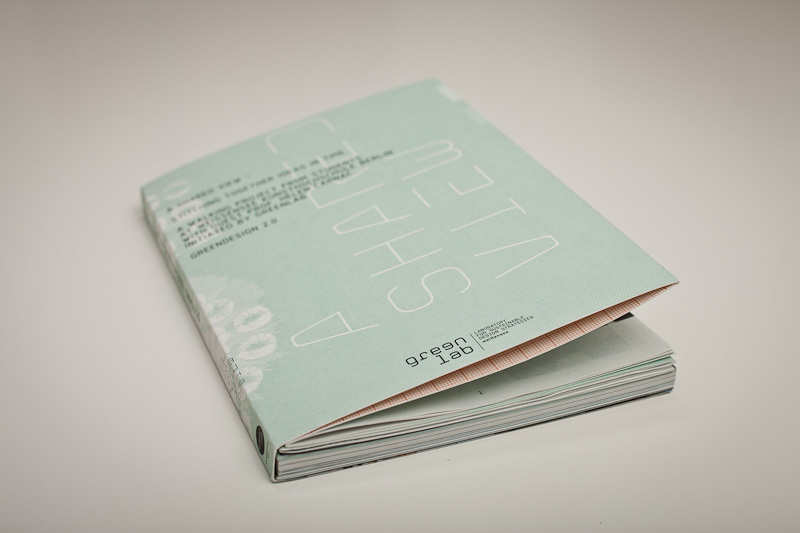 They also each produced a body of work and the second part of the publication is devoted to these projects. These ranged from a project by Elise called ‘How does your garden grow?’ – identifying different types of urban gardening in Berlin. Tine’s ‘What would you call this place?’ – interviewing and gathering stories from people she met along and around the route of the M10 tramline. In her project ‘Time Tracing’ Carmen mapped daily journeys, culminating in the development of a bag design on which you can accumulate and draw your own journeys. Through Eriko’s project ‘Zu Verschenken’ she aimed to developed a system of co-design and textile workshops in her neighborhood. Julia, an Erasmus student from Stockholm, developed her project ‘Thinking’ by finding objects and local patterns on the street, collecting memories and marking her time in Berlin by holding an event in a local park where she lit and left a series of lanterns. Finally David’s ‘Following the path of Time’ was a photography project about nature re-claiming the urban sprawl of Berlin, I should also mention Michelle (David’s partner) who joined us on many of the walks and contributed with thoughts and by sharing and exchanging south american spanish language lessons on the way. At some point during the project Adrian had to focus on his fashion studies and the emphasis and requirement became the making of a series of products which took him away from completing this project. I would like to thank all the students for their generosity and open-mindedness. Taking on a project which is so open-ended can be difficult, but from the first walk (which the students later described as a journey of ‘co-confusion’) they embraced the things that they encountered and developed a series of fascinating projects and ideas. Each of them has acknowledged the development of new ways of thinking and each of them embraced the materiality of this compelling and ever evolving city.